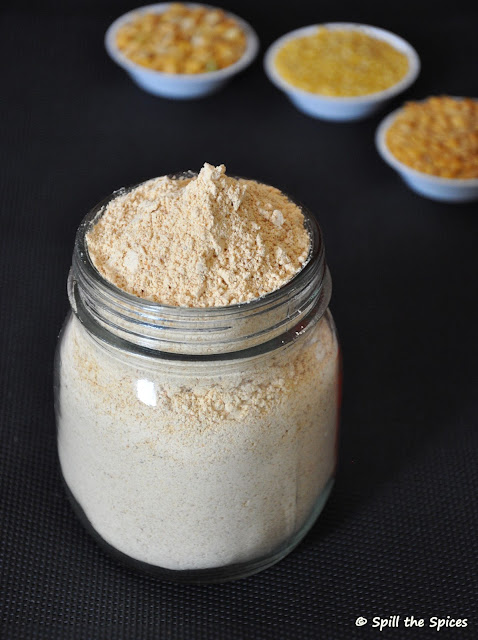 South Indian cuisine is famous for its gun powders/podis. Kandi podi is one such classic Andhra specialty. You can see this podi kept on tables, along with different pickles, in all Andhra restaurants. A typical Andhra meal is started by mixing some kandi podi with hot steaming rice and a dollop of ghee. This Andhra style paruppu podi / lentil powder is very flavorsome, aromatic and packed with proteins. Kandi podi was one thing that drew me to often visit Andhra restaurants. You can't ever get bored of this lentil mix! Kandi podi is a blend of thuvar dal, chana dal, moong dal, red chillies and cumin. Dals and chillies are dry roasted and ground to a slightly coarse powder. I had been craving to have this kandi podi for long time and that's when I got the recipe from my friend J. Thanks dear for this authentic kandi podi recipe, am just loving it! Enjoy with hot steaming rice and a drizzle of ghee. 1. Dry roast the thuvar dal, moong dal and chana dal separately in low-medium flame until it becomes reddish brown color. Set aside in a plate to cool. 2. Dry roast the red chillies till till turns dark red. Add cumin in the same pan and fry for 10 seconds. Set aside to cool. 3. Grind everything together with salt to a slightly coarse powder. Transfer to an airtight container. 1. Roast the dals separately so that each dal is roasted evenly. 2. 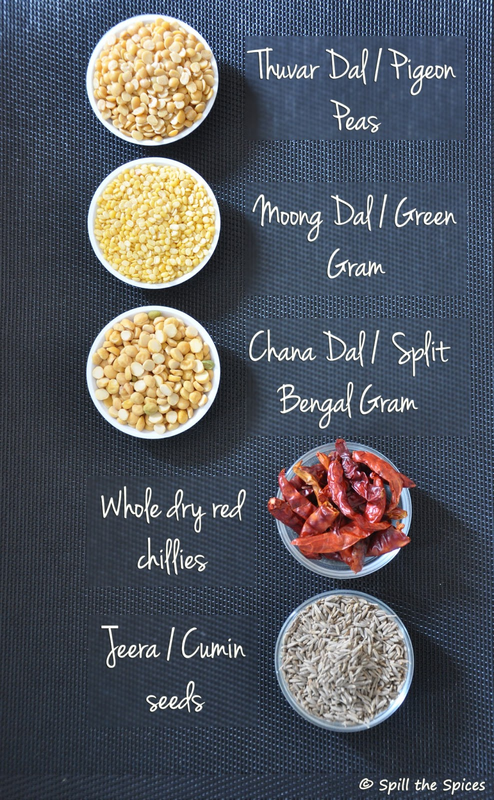 Adjust the amount of red chillies according to your spice level. With 10 red chillies, it was moderately spicy. 3. Store in a dry airtight container and always use a dry spoon. 4. Do not grind to a fine powder. The powder should be slightly coarse. Delicious parippu podi Love it have with rice. 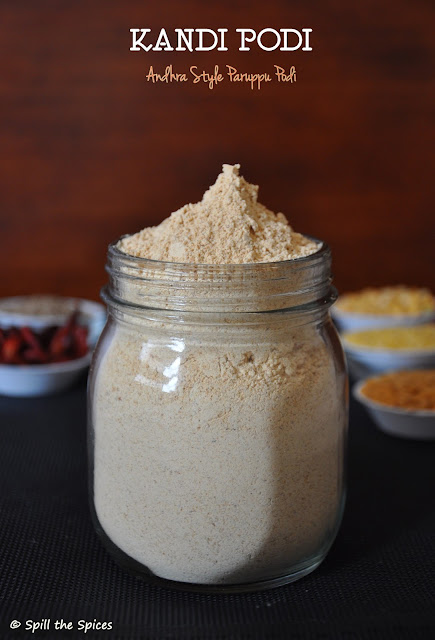 Flavorful podi.. Healthy and delicious too.. Love your presentation..
Yummy kandi podi looks so nice. I am a big fan of paruppu podi...lovely clicks..
Beautiful clicks. Paruppu podi, ghee and rice is a heavenly combo. Loved the presentation and the pics. Very flavorful podi. 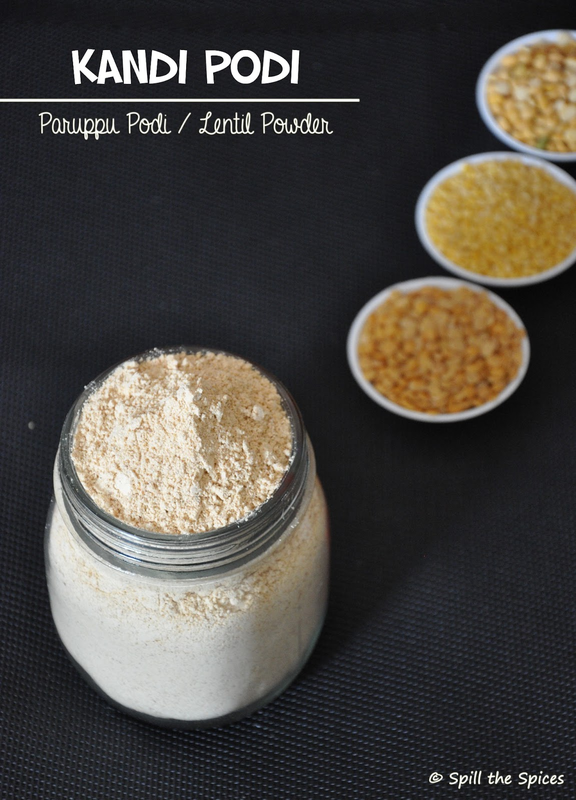 Looks very inviting.. Love this flavors of this podi.. Bookmarked ! !